I have decided to join in with another Reading Challenge for 2018 and this one is courtesy of the wonderful The Book Vipers - GoodReads group and looks set to test us all - mainly in searching out titles to fit all the topics! I may be requesting suggestions for some of them so get your thinking caps on please! I need help... in more ways than one!! So the challenge is to read a book that fits the titles below! There are 3 levels that can be done - 9 squares, 16 squares or the full 25! I'm aiming for the 25 so we will see how we go! Have already started a little looksie through my shelves to see what books I can get read that fit the topics! Here's my initial list - with a number of gaps! - so hopefully I can complete the challenge! A Classic - lots of candidates on my bookshelves so will choose later! A Book About Money - struggling with this one so any suggestions welcome!! A Book Under 100 Pages - not found any on my shelves yet so might have to go shopping! A Book Of Poems - very poor poetry knowledge so where should I start?! A Book You Have Borrowed - will raid the library! 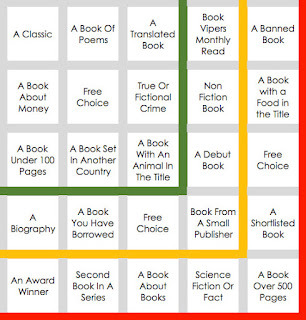 A Banned Book - tempted to go Harry Potter or Alice in Wonderland or would you recommend something else?! A Book Over 500 Pages - THE CROW GIRL by ERIK AXL SUND - 750 pages!! So any suggestions or help you have for me would be most welcome! Free choices will probably be from my NetGalley shelves - I WILL get that under control in 2018!! I will carry on my search and may even end up changing some of my initial choices - that's what normally happens! 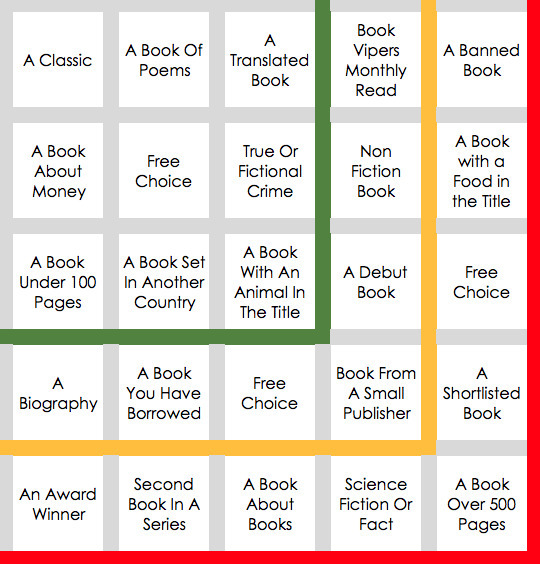 - but i'm looking forward to this challenge and trying a few different kinds of books! !